Night sea is always beautiful and romantic. And how beautiful sailboat at moonlight? All these things you will find in our new Moonlit Ship Screensaver. Especially for romantics and nature lovers. Beautiful, stylish and expressive splash! The graphic effects are very realistic and performed at a high level. By installing our screensaver you will emphasize your exquisite taste. All our screensavers are free! 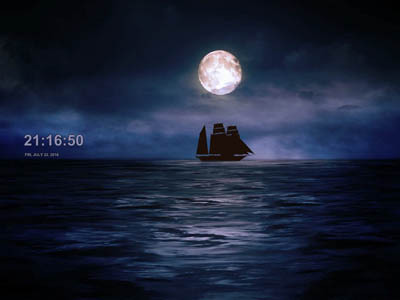 Download ship screensaver and enjoy it now! Just distract from the work for a few minutes, sit back and enjoy the wonderful world of tropical seascapes created on your computer or laptop screen. Download this screen saver and open a window to the world of joy, warmth and inspiration! CubePhotoShow is a fully customizable screen saver that displays your favorite pictures as a moving 3D cube. CubePhotoShow is free, light and easy to use, in few minutes you can create your personal 3D screen saver. New Year screensaver showing time from a collection of new free screensavers from http://www.newfreescreensavers.com will remind you about the coming holidays and create a cozy atmosphere. No spy/adware, virus-free.